Already in use or being piloted at almost half the world’s top 20 banks and in several buy side firms, EarlyBird enables traders, researchers and portfolio managers to quickly identify trading opportunities, protect their financial assets and gain a rapid understanding of what’s causing the markets to move before the news hits the wires and filters down to their competitors. EarlyBird is now available as a mobile app, so users can access the same secure, user-configurable search and curation tools on Android and iOS devices. EarlyBird is principally used on trading floor screens either as a Symphony integrated partner app, as a rich desktop program running in a secure OpenFin window, or simply in a web browser. 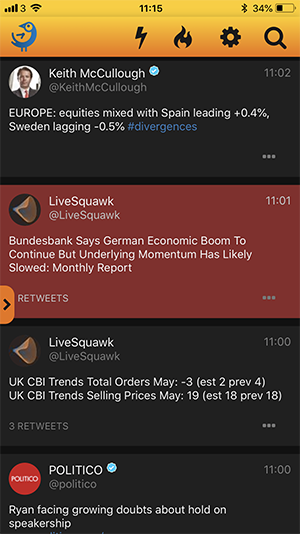 Users can follow any Twitter accounts, or harness EarlyBird’s AI-assisted intelligent financial searches to uncover breaking news across equities, FX and global macro events. With Tweeting and messaging completely blocked by EarlyBird, the compliance issues that have held Twitter back in finance have been solved. EarlyBird Mobile is available immediately to existing users on Android via Google Play, and on iPhone and iPad via the Apple App Store.